The second map by the PBMP is now online. 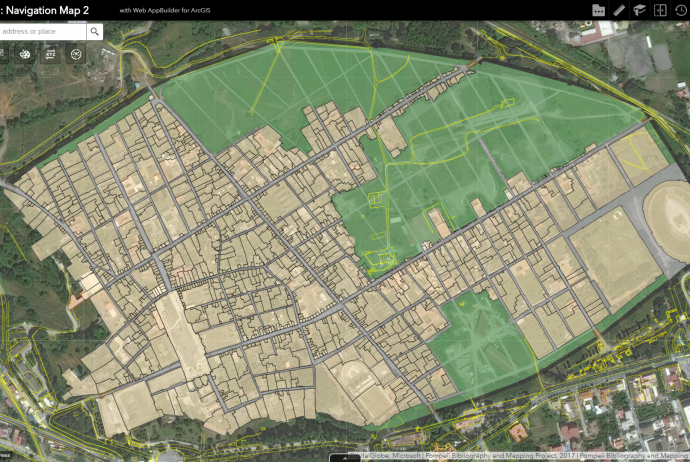 Updated with new data and a richer environment, users can explore all 640,000 square meters of Pompeii’s urban landscape from an overview of the entire site to individual objects, such as fountains, millstones, or stepping-stones. To better align with underlying base maps and satellite imagery, the PBMP map data has been nudged slightly (-1.414m, -4.648m) to better spread error and distortions from the original CAD across the site. Although titled “Navigation Map 2”, this map includes important developments towards our planned phase II (information map) and phase III (query map) maps. New information on the earliest artifacts, on street features including rut depth and individual objects, and on tombs are all added into this map. New ways of searching the data are also now available. A standard layer list and legend of symbols (folder icon, upper right) is now accompanied by a table of attributes (tab, bottom) and a search bar (upper left) that can find locations by ID, by name (mostly in Italian), or by address (in Region.Insula.Door format, e.g., VIII.7.1). For a quick view, Navigation Map 2 is embedded here, but for optimum use, go to the map page. Navigation Map 1 relied primarily on a series of nested tiles (images of the map data) to quickly render the complex and relatively large amounts of data that describe Pompeii. To add data-rich layers back in, individual shapefiles were uploaded into the map to overlay these tiles and offer spatial and attribute data through pop-ups. For Navigation Map 2, we have moved to ArcGIS Online’s Web Apps for our interface and use Hosted Feature Layers for each data layer, some of which have been combined into larger, related group layers. For example, “Topography” contains the excavated and unexcavated city blocks, fortifications, defensive towers, city gates, fountains and water towers. Similarly, “Streets ” and “Street Features ” contain multiple classes of objects. We chose to move to Hosted Feature Layers because the of the ease of sharing these data, both between the PBMP working files on our computers and the UMass ArcGIS servers, and with our community of users. In the first instance, we are able to edit our files offline and seamlessly share back to the current datasets and maps without interrupting the appearance (symbologies) or behaviors (labeling, pop-ups, overlays, tranparencies, etc.). In fact, these layers permit editing directly through the browser as well as the ability to sync such changes to the server when editing is done in an offline session. These later features are turned off by default, but their potential power for using the PBMP data for research on-site in Pompeii is enormous. This potentiality echoes our desire for these data to be easily available for use, download, and reuse by a community of people – scholars, students, and the public – interested in Pompeii. For example, I have used PBMP data in my research (e.g., Traffic Systems of Pompeii, “Measuring the Movement Economy“), for assignments in my teaching (Topography of Pompeii, Objects of the Early Excavations, or Funerary Landscapes), and, to the degree to which this site is a service to the public, in outreach. Thus, not only do we want the Pompeian community to have the best data to make maps of Pompeii, we hope that data improved and enriched by the community might be reinvested into the PBMP. Hosted Feature Layers are the best means to make this possible. If you are not an ArcGIS Online user, these Hosted Feature Layers can still be used to create online maps of your own. If you are an ArcGIS user, there are more options available including exporting these data to your own account or downloading them as Shapefile, CSV, KML, Excel, FGDB, or GeoJSON. To get an account, first see if your institution has an organizational account. If not, or if you want to get started right away, sign up for Public account (here’s the difference). All of the current data are hosted in the map and are available there, but are also listed and linked below to see each file and its documentation independently. Artifacts of the Bourbon Excavations*! Curbstone Material (after Saliou, 1999)*!
! Indicates layer is “in progress” and should be considered for illustration purposes at the time of posting. For information on the original files and their creation, see the documentation on Navigation Map 1. New Tools for Analysis and Interaction. Perhaps the most powerful aspect of Navigation Map 2 is the suite of tools now available to the user to interact with, query, analyze, and even transform the data in the map. These are built-in functions (widgets) in the ArcGIS Online Webapp that are easy to use, but work best for users who already have an ArcGIS Online account. Below is a short minute video that demonstrates the most basic functions of the map, beginning with navigation and ending with the analysis tools. A fuller description of these tools and their configuration within the PBMP, as well as links to their documentation in ArcGIS, is further below. Standard controls navigation controls are found in the upper left of the map, including Zoom in (+) and Zoom out (-) (though the scroll wheel on a mouses works as well), Home button (returns to overview), and Current location (for use if on-site in Pompeii). At bottom left is a Scale bar in metric units with a Coordinate viewer in decimal degrees that can find the longitude and latitude of any point in either the WGS84 (default) or Monte Mario 2 projected coordinate systems. A small arrow in the upper left corner opens a map overview window, while the icon “[ ]” in the upper right enters full screen mode. Also at upper right is a Search bar that can be used to find locations specific to Pompeii in the map. First, select “All” (or a particular layer) from the drop down menu and enter your term. You can search for the names of streets, IDs of street features, names of particular buildings, or their addresses. The search uses predictive text, so adding a Region (in Roman numerals) and an Insula (in Arabic numbers) separated by a period, such as “I.1” will reveal a partial list of building addresses based on their primary doorways. Similarly, searching for a building name (most often in Italian), such as the “Casa del Fauno” returns a list all names of that building in a single field, of which Casa del Fauno is one. Clicking on the desired result will pan and zoom the map to that location and open up a pop-up window with information about that location from the layer that was searched. Clicking on the map again, or anywhere in the map, will also open a Pop-up Window with one or more panes of information therein. An right-pointing arrow in the upper right of the pop-up advances to the information available in other layers about this location. At the bottom of the pop-up window are three dots that open up a sub-menu that will pan the map to the selected location, open the record for that location in the Attribute Table, or add a Marker into the map. Creating a marker leaves an icon in the map at the desired location and produces its own pop-up with longitude and latitude information as well as a dedicated link to this location that can this specific place with anyone on the internet. There are a number of new tools in the right side of the map’s header. The first of these is a group of three tools called “Layer Control“, which contains a Layer List, Legend, and Basemap Gallery selector. Measure: “The Measurement widget allows you to measure the area of a polygon, length of a line, or find the coordinates of a point.” The PBMP configuration returns distances in meters, areas square meters, and coordinates in decimal degrees. Swipe: “The Swipe widget enables you to easily compare the content of different layers in a map. It provides horizontal, vertical and spyglass view modes. You can slide the swipe tool or move mouse around to reveal the content of another layer. For example, you may want to use it to show before-and-after imagery of a flood, or display two related thematic layers in a map.” The PBMP configuration has the “Building Functions” layer as the default layer. This layer, however, is turned off in the layer list and must first be activated before the Swipe will activate it. Time Slider: “The Time Slider widget enables you to view temporal layers in a map, and play the animation to see how the data changes over time. Using this widget, you can control the animation of the data with buttons to play and pause, go to the previous time period, and go to the next time period.” There are currently no time enabled layers in the PBMP data. However, dates of excavation are to be expected soon. Print: “The Print widget connects the web app with a printing service to allow the current map to print.” The map will print in multiple sizes and formats. The PBMP configuration has the “Map Only” layout and PDF format as default and automatically adds attribution information. Changes in map scale, extent, pixel size, and DPI are available in the “Advanced” tab. About: The About widget displays information about the map and the Pompeii bibliography and Mapping project. Analysis: “The Analysis widget provides an easy way to use ArcGIS Online or Portal for ArcGIS spatial analysis tools in your application. With 25 analysis tools, the same as those in the ArcGIS Online Map Viewer, you can configure one tool per widget or multiple tools in a widget. See the Perform analysis section of the ArcGIS Online help for an introduction to spatial analysis, the license requirements to access analysis tools, and details about the usage of each tool.” An ArcGIS Online account it required to use these tools.